What is the Definition of Stewardship? Good evening! I am very happy to be here and speak to all of you on the subject of Christian Stewardship. For each one of us is called by God to be a steward. When we act in the role of steward it means that we have been entrusted with something that does not belong to us. For instance, if you loan your car to me, both you and I would expect that I would take very good care of your vehicle. You may permit me to use it. However, you would expect me to take care of it and return it in substantially the same condition it was when you loaned it to me. This is an example of stewardship. as taught by Christ, means that our money, every penny, comes from God. Thus, a person’s duty is to return as much as possible during his lifetime. From this perspective, “he who dies rich – dies disgraced,” as Andrew Carnegie declared. abilities and talents. These are our tools to use as stewards or managers of God’s affairs while we dwell in this world. What does Stewardship mean to us then? What should all of this mean to us? The following list of statements are all different, each explaining the meaning of stewardship in a unique manner. They are all, however, valid, since they contain the essential elements of service and faith. 2. 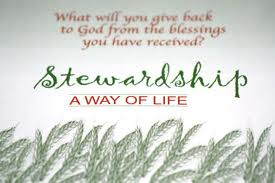 Stewardship is being a responsible and concerned caretaker of Christ’s Church. It is also learning how to enjoy Church life and be happy in Church work. 3. Stewardship is the caring for the needs of one another. 4. Stewardship is offering of one’s self as Christ gave His life for us. 5. Stewardship is what a person does after saying “I Believe”, as proof of that belief. 6. Stewardship is being devoted and totally committed to serve God and His Church morally, spiritually, physically, and financially as an individual and collectively as a family unit. Christ in his love for others. Certainly this is not an exclusive list of definitions. It does demonstrate, however, that stewardship can be defined in many different ways. As long as the basic elements of stewardship are preserved – the careful and responsible care of something entrusted to us — definitions can legitimately vary, each designed to meet the needs of a specific set of circumstances. servants invest the money and double the amount. However, the third servant buries his master’s money, and when his master returns he gives him back the single talent. These are the words we must work to hear. We can only do so by taking what God has loaned to us, and giving back to Him, His Holy Church, and our needful brothers and sisters in Christ! The choice is ours and ours alone! May God’s name be glorified in us, and may His blessings be upon us!